Rose City Comic Con Day Two! Jaimie Cordero! Espionage Cosmetics! Jenn Arledge! It’s day two of ROSE CITY COMIC CON!!! We talk with Jaimie Cordero from Espionage Cosmetics! Kaylie and John talked to her for over an hour, so once we figure out what to do with all that awesome audio (release it, duh) we will! Check out their awesome stuff here! Friend of the show Jenn Arldege joins us again and doesn’t really say much. I wonder what’s going on? John and Kaylie had some mishaps today, take a listen to the end to hear them all! 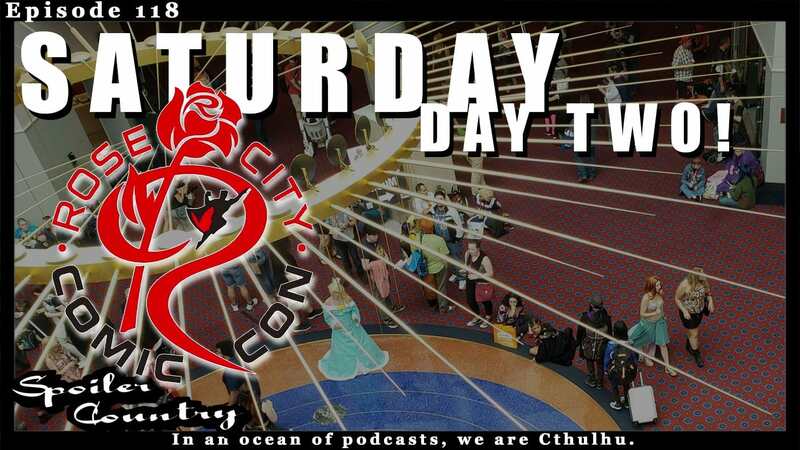 ← Rose City Comic Con 2018 Day One! Lauren Dabb & Ron Brister! Greg Smith & Michael Tanner! Clayton Hollifield!